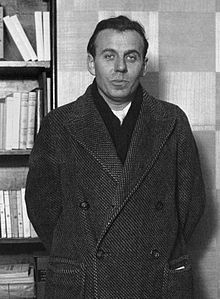 Louis-Ferdinand Céline (French: [selin] ( listen)) wis the pen name o Louis Ferdinand Auguste Destouches (pronounced [detuʃ]; 27 Mey 1894 – 1 Julie 1961), a French novelist, pamphleteer an physeecian. He developed a new style o writin that modrenised French leeteratur. His maist famous wark is the 1932 novelle, Journey to the End of the Night.